We feel it is important to tell you that not only is Tascosa Office Machines an Amarillo owned business but is credibly the largest copier/printer business in the Texas Panhandle. This uniqueness means we will not only be able to supply your copiers but we will be able to support you with the highest level of professional service. Our Amarillo staff consists of forty-five dedicated employees. Of these employees, twenty-one are certified technicians able to support your copier needs. With additional employees in administrative support, your calls are answered by a real person and not by an automated system. This staff can support all aspects of service, dispatch, local billing and all other administrative aspects of this contract. Additionally we have full time IT people for networking issues and sales people for any training needs you may have. We also have six other full service locations: Lubbock, Lamesa, Roswell, Hobbs, Raton, and Trinidad with over eighty total employees. Quality and excellence is a Tascosa Office Machines achievement. By having a Canon certified training facility for our service staff, Canon partners with Tascosa Office Machines so that we can train other dealers at our facility. Our trainer is trained with Canon’s factory teachers before the equipment is released to the public market place. Because we have our own training facility in Amarillo, we must teach the same curriculum taught at Canon. Our technicians can achieve up-to- date technical training on the Canon products we sell. 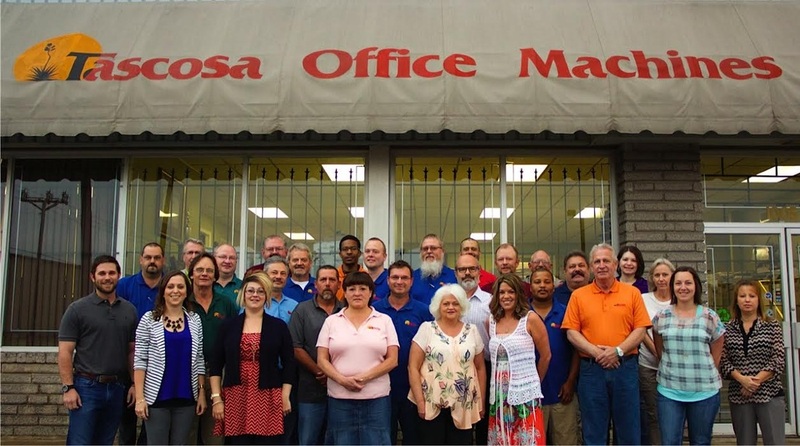 Tascosa Office Machines takes great pride in not having just one or two trained technicians to support the customer, like much of the competition. We have over twenty trained technicians to support Amarillo customers, along with our administrative and sales staff to facilitate contracts and commitments to our customers. Tascosa Office Machines can be the only company involved with large contracts from start to finish. We will bill the maintenance and lease contract without any third party finance company involved, giving you the local support you deserve. We have done this for many of our larger accounts, such as: The City of Amarillo, Amarillo ISD, Potter County, Amarillo College, and West Texas A&M, which each have thirty-five to eighty-five copier/printers on lease with Tascosa Office Machines. We look forward to showing our customers a much higher quality of service, parts supply, billing expertise and decision-making with West Texas courtesy. Tascosa Office Machines is not always offering the cheapest price in town. (You get what you pay for!) We are offering you the best support and equipment in terms of value, reliability and maintenance after the sale! We have been in business for over thirty years. Headquartered in Amarillo, we support local businesses, hospitals and schools. Tascosa Office Machines contributes to many churches and charities. Tascosa is a strong supporter of Kids Inc. and the YMCA; we donate several copiers, printers and fax machines to churches and non-profit organization every year. As a member of the Amarillo Chamber of Commerce, we are enthusiastically invested in Amarillo’s economy. Our dollars are not diverted to St. Petersburg, Florida or Rochester, New York. Our dollars stay in West Texas.